Outputs the liquid level continuously by measuring the liquid pressure near the bottom of the tank. Both the sensor and conversion unit are compact so they are easy to install. 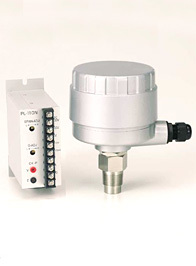 A two-line system is use to connect between the sensor and the conversion unit so that they can be separated up to 500 m.
The liquid contact parts are made of very corrosion-resistant SUS316. Therefore, the meter is very durable and corrosion resistant. * Specify the measuring range when ordering.